Hundreds of people gathered at Ryerson’s Mattamy Athletic Centre (MAC) on Friday to listen to Col. Chris Hadfield talk about his unexpected journey to space. 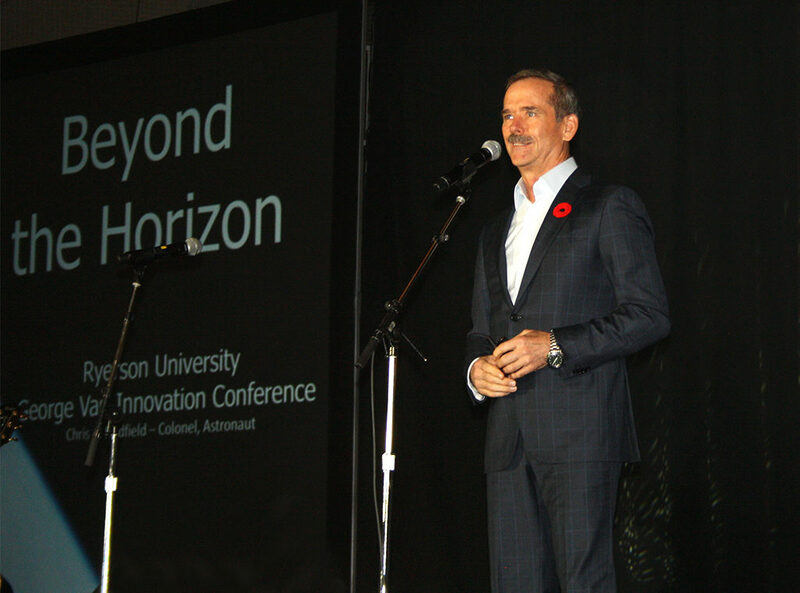 Hadfield spoke at an event titled, “Beyond the Horizon: The Hadfield Experience.” He said his journey to space began when he was a young child building his own rocket out of a cardboard box. His dream was unrealistic at the time, he said, but in later years, when he landed on the moon, he believed anything was possible. Hadfield told a rapt audience he first applied to become an astronaut after someone referred him to an advertisement in a newspaper. He then went on to become the first Canadian astronaut to walk in space in 2001 and the first Canadian commander of the International Space Station in 2012. “If you ever get the chance, take that ride, it’s a great ride” he said as he talked about his journey to outer space. 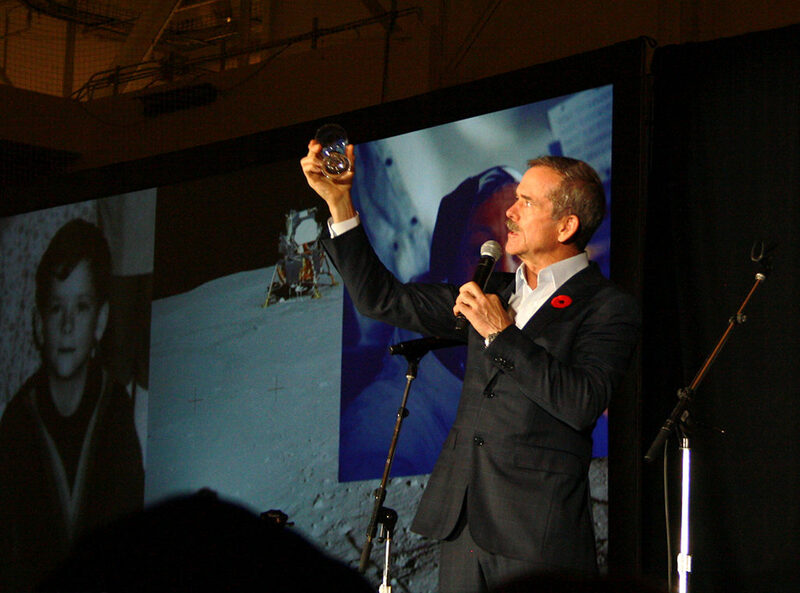 In addition to walking down memory lane, Hadfield also used the time with his audience to discuss the big space challenges of the modern age. People around the world are working to try and create new and improved technologies to progress space study. Elon Musk, for example, is one of several billionaires who have invested time and money into space exploration efforts. Hadfield said the biggest current challenge is finding a way to make the launch less dangerous. The technology is very primitive, and they are trying to figure out just the right propulsive system, he said. “The most experienced astronaut in American history is Peggy Winston (…) if you took all of her 58 years and said, ‘Where did you take the biggest risks?’ About half of all the risks she took in her life were in the 27 minutes she rode rockets, that’s how dangerous they still are,” Hadfield said. Mickey Patel, a long-time follower of Hadfield and Ryerson University alumni, said he was proud of his fellow Canadian. 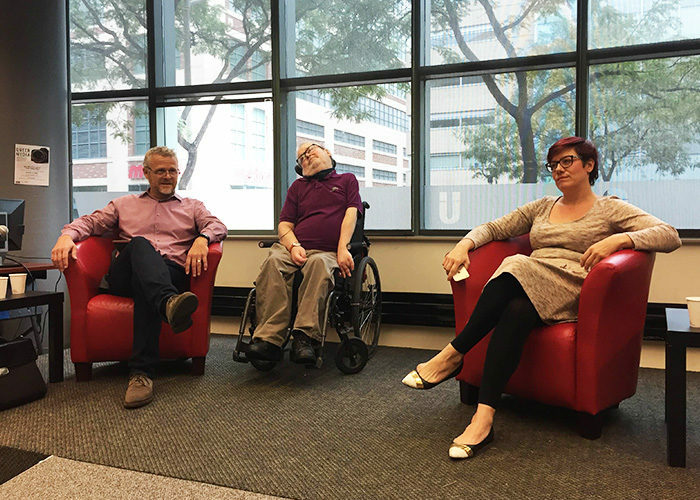 He said he was happy that Hadfield was “supporting the future leaders of tomorrow,” and sharing his personal experiences, knowledge and thoughts on what it takes to get to become a colonel and an astronaut. 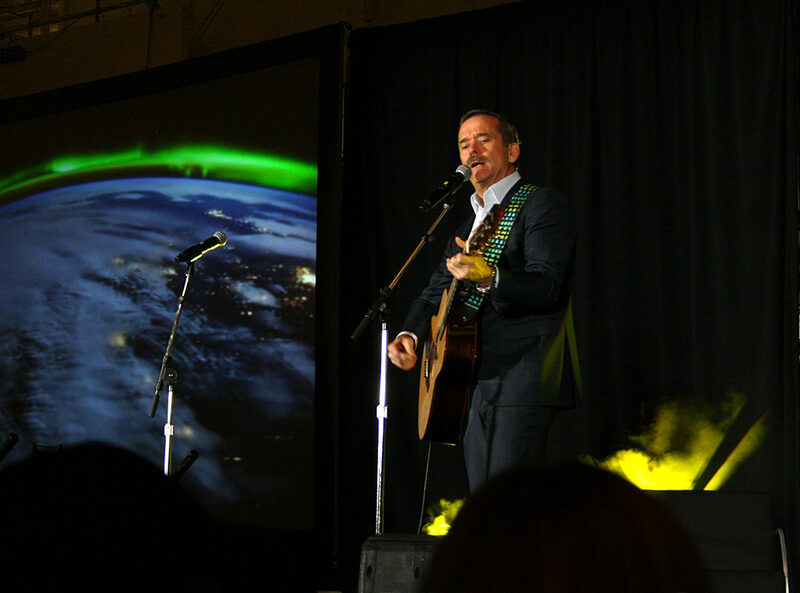 Hadfield ended the event by picking up his iconic guitar and singing two songs to the audience. He started by playing “Is Someone Singing,” which he wrote in space, inspiring a generation of young Canadians like Zolfaghari. And what session on space travel would be complete without a rendition of the famed David Bowie’s Space Oddity? Hadfield closed the night with his rendition of Major Tom’s journey.